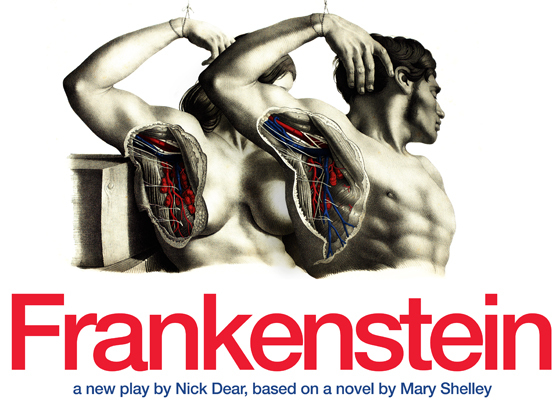 When I entered the theater to see director Danny Boyle’s production of Mary Shelley’s Frankenstein at the beginning of June, it smelled like artificial butter, the lighting was poor, and my feet were unceremoniously shoved into a pair of raggedy black flip-flops. If that’s not exactly what one would expect upon entering London’s prestigious National Theatre, it’s because my sandals carried me, not through the doors of the National Theatre, on the south bank of the Thames, but into the Palace 9 Cineplex, in the bustling metropolis of South Burlington, Vermont, USA. This witchcraft was accomplished thanks to the National Theatre Live program, through which the theater broadcasts its performances live to cinemas across the English-speaking world. Their productions are not only beautifully staged and beautifully executed, but also beautifully filmed. Despite some camera angles that you wouldn’t experience at live theater, I didn’t feel as if I were at a cinema, but seated in the best possible seat in the whole of the National Theatre. The show played twice, though I was only able to secure tickets for the first night. Benedict Cumberbatch, of BBC Sherlock fame, starred opposite Jonny Lee Miller (who, oddly enough, has recently been cast as Sherlock Holmes in a CBS television series called Elementary, airing in the fall) in this adaptation by playwright Nick Dear. On night one, Miller took on the role of Victor Frankenstein, while Cumberbatch played his monstrous creation. Here’s the twist: on the second night, they swapped roles. 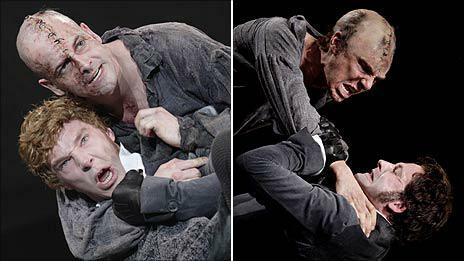 Benedict Cumberbatch as the doctor and Jonny Lee Miller as the creature — and vice versa. I felt after this performance as I had felt after reading the novel for the first time, struck with how much more there is to the story than just cheesy monster horror. It’s a nuanced and beautiful story, and Dear’s adaptation is elegantly pared-down from the original. The frame of the story, the begin-at-the-end set up with the adventure boat in the Arctic, is gone, as are a few key characters from the book – no Justine, no Henry Clerval. Gone, too, is Elizabeth’s backstory and Victor’s mother’s dying wish. Somehow, though, the alterations in this retelling seemed simply to concentrate its meaning, rather than remove anything absolutely essential. These gender-related themes are among the many subjects that bubble to the surface of this contemporary retelling. Perhaps Dear’s decision to stay faithful to Shelley’s essence in a drastically different form is a further reflection of today’s cultural zeitgeist. This is an age where Oprah’s last book club read a revamped edition of Charles Dickens’s Great Expectations, where TV dramas like the BBC’s Downton Abbey and Cumberbatch’s own Sherlock dominate air time, and saucy film adaptations of novels like Leo Tolstoy’s Anna Karenina and F. Scott Fitzgerald’s The Great Gatsby are shaping up to be big blockbuster hits. This is the age of the period piece, of the online sophisticate, where anyone can be a film critic, book reviewer, or twitter philosophe. It’s an era in which high-brow literature mixes with lower-brow social media, special effects, and attractive actors. We could see National Theatre Live as culture for the masses – one doesn’t need to be a worldly London urbanite to see Mary Shelley’s words come alive via Nick Dear, Danny Boyle, and Benedict Cumberbatch. In researching the piece after the show, I found zillions of tumblr posts devoted to the production, mostly from young teen girls who raved about the performance and were sending away for Amazon copies of Dear’s script. Sure, they may initially have been motivated by the promise of Cumberbatch or Miller in scant clothing, and a good number of the posts involved strings of exclamation points or OMGs, but many also used it as a platform to discuss the theatrical aspects of the performance, to perform detailed character analyses, or simply to marvel at the beauty of the words and acting. As I read, their posts belied their age and apparent maturity level to reveal the border between fandom and intelligentsia, blurred. Frankenstein’s creation acts as a mirror for his own humanity, exaggerating and accentuating his shortcomings and showing that in some ways, the monster is better than he is. In that way, the Creature created by Nick Dear, Danny Boyle, Benedict Cumberbatch, and Jonny Lee Miller is a reflection of its contemporary audience, continuing – like those tumblr tweens – to blur the boundaries between society’s common technology-consumed masses, and its traditionally accepted forms of high art. In the theater with me when the credits roll is a microcosm of Burlington, the town where I grew up. I see University of Vermont professors and college students; a group of thirteen-year-old girls; a family with two younger kids, fighting over their remaining popcorn; a pair of actors; a woman with a huge head full of dreadlocks; an older couple, exiting the theater arm-in-arm; a few couples on dates; a man with a tattoo of a dragon snaking up his tricep; and plenty of other ordinary people, all looking happy and most in conversation. My dusty flip-flops fit in here. This is not a show made for intellectual elite, nor will it be the next great action or romance film, but here, at the Palace 9 Cineplex, we ordinary people all had a little bit of both.